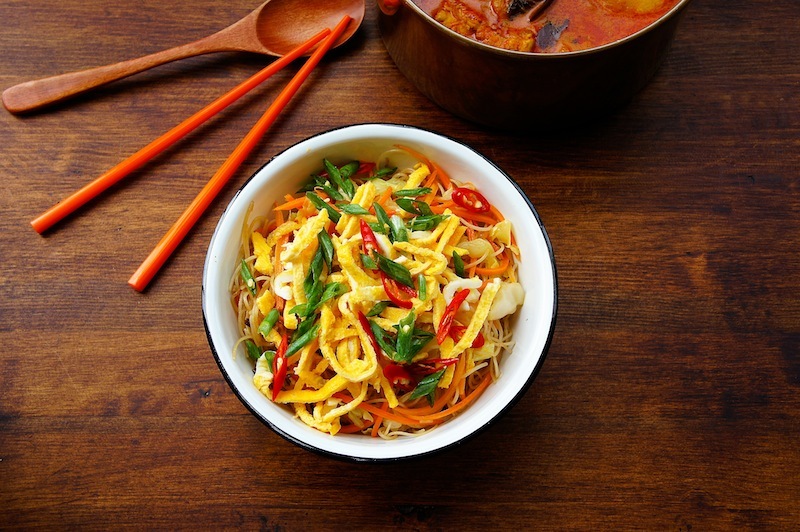 This is a homely rice vermicelli recipe, packed with vegetables and seasoned with lots of freshly ground white peppercorns. A quick and healthy meal, full of fresh flavors, and I'm sure to become your family's favorite. In a large wok over medium heat, mix in the oil and cook the garlic and onion until light golden in color. Turn the heat on high, toss in the cabbage follow and softened rice vermicelli. Use a tong and spatula to stir-fry, then add chicken or vegetable's stock and season with soy sauce, pepper, and salt. When the rice vermicelli almost dry, mix in the carrots. Continue to stir-fry until all the ingredients are well mix and the carrots are just cooked, and adjust the seasoning with sea salt. Serve warm with omelet, red chilies, and scallions. yum, this is my fav too! Just made a batch of rice noodles last week. We loved them as a salad. Nice easy stir fry recipe! My kids really like to eat this kind of dish. I will cook this for them so that they can eat a lot later.